Hibs boss says attitude was all wrong as his side blew a lead against Hearts in the Edinburgh derby. Hibs’ losing streak stretched to six games with their 2-1 defeat to Hearts in the SPL lunchtime match. 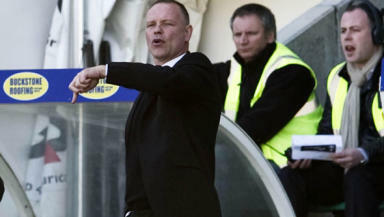 The run is the Easter Road’s worst for 13 years and the club’s manager said the players’ attitude was to blame. John Hughes saw his side go ahead after Anthony Stokes scored from the penalty spot but said the side didn’t have the courage to impose themselves on the match prom a position of strength. "I think it scared us and I think we were scared to go and win the game," he said. "We sat back too deep, we stopped the things that we were doing the first half. When you do that, it's a recipe for trouble." The manager, who has seen his once high-flying side slip from third to fifth as their European hopes hang by a thread, describes the Hearts equaliser and winner as “inevitable”. Hughes also criticised the manner of the goals conceded by Graeme Smith. "We sat back too deep, we stopped the things that we were doing the first half,” he said. “When you do that, it's a recipe for trouble." The Easter Road side can still overhaul Motherwell for a European place in the league with two games still remaining in the SPL. The sides play each other at Fir park on Wednesday night in a match that could determine their final league positions. Hibs then travel to Tannadice to play Dundee United on the final day of the season when Motherwell face SPL champions Rangers at Ibrox.